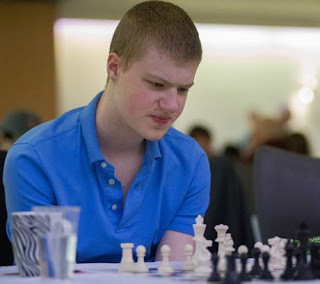 21-year old Alan Merry recently travelled to Jersey to play in the Polar Capital Open. Seeded seventh in a field that contained eight GMs and seven IMs, Alan finished on 7 points out of 9, joint winner alongside GM Tiger Hillarp Persson. with whom he drew his individual game. His performance rating, adjusted in accordance with FIDE rules (one opponent re-rated 2200 for the purpose of GM norm calculation) was just over the required 2600, to give Alan his second Grandmaster norm. He also gained 20 rating points from the tournament, and now needs to gain a further 44 rating points, along with a third GM norm, to qualify as a Grandmaster. Alan certainly seems to enjoy playing in Jersey. In 2016 he scored an excellent 6/9, losing only his round 4 game. In 2017 he was unbeaten on 7 points, and was joint winner with IM Jack Rudd. This year his only loss was in Round 7 against GM Jon Speelman. He therefore went 20 games unbeaten (five in 2016; nine in 2017; and six in 2018). This year he played six GMs in succession (four with the Black pieces), scoring four points (+3, =2, -1).